The aesthetic of Ralph & Russo, the only extant British haute couture house, can be summed up as dresses in which to marry a prince. So while Kylie Minogue sat front row between the supermodels Karlie Kloss and Natalia Vodianova, and despite the actors Lupita Nyong’o, Tracee Ellis Ross and Allison Williams wearing the label on the red carpet at the Screen Actors Guild on Sunday evening, the most significant name currently linked with the brand belonged to a certain Meghan Markle, who was nowhere to be seen. Perhaps Markle, who sparked rumours of a Ralph & Russo wedding dress when she chose the brand for her official engagement photo, is one of the brand’s 1.7 million social media followers. If so, she will have seen the show’s finale, an off-white duchess satin gown with a draped bodice, long train encrusted with leaves of Swarovski crystals and lace veil embroidered with silk petals. Ralph & Russo is sole heir to the grand British couture tradition of Hardy Amies and Norman Hartnell. The designers Tamara Ralph and Michael Russo moved from their native Australia to London, where the business has been one of British fashion’s biggest success stories since it opened in 2007. They now employ more than 400 people, with a townhouse in Mayfair for client fittings and a large atelier where the embroidery department alone is 30-strong. Angelina Jolie wore a Ralph & Russo suit to Buckingham Palace when she was presented with her honorary damehood by the Queen. 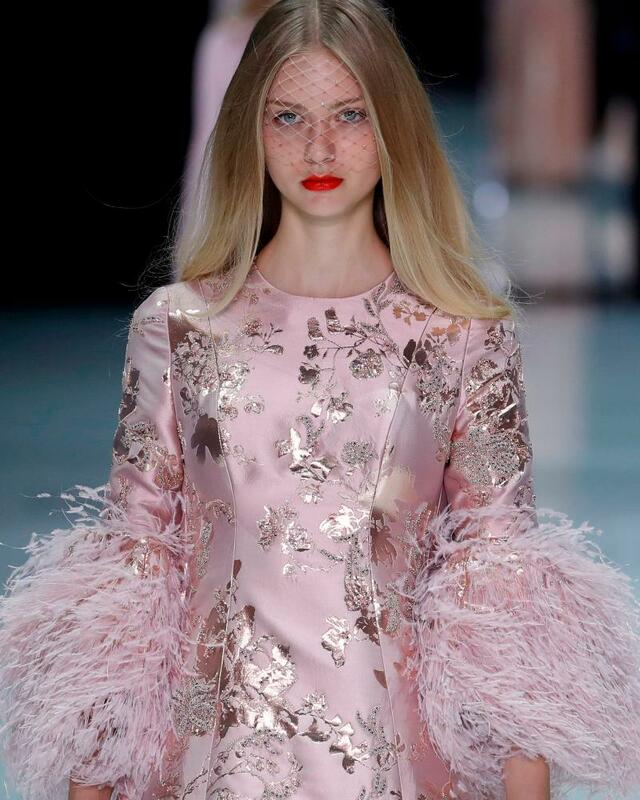 Its many devoted clients desire fairytale, so that was exactly what the Paris show delivered: dreamy fantasies in frothy mint organza, blush pink silk gazar and ice blue Chantilly lace, and bombshell gowns in black velvet and metallic satin. There is no pandering to practical details at Ralph & Russo. Sleeves are largely absent, unless made from fine-spun silk fringing, and the few coats to be found are fashioned from ostrich feathers, or sheer tulle. At Christian Dior, spiritual home of modern designer feminism, the mood took a surreal turn – literally towards surrealism. It is 18 months (a lifetime in fashion) since Maria Grazia Chiuri made her debut as Dior’s first ever female designer with those We Should All Be Feminists T-shirts, in which her early adoption of activist-chic has boosted Dior’s profile among consumers, and its profits. Above a black-and-white chequered catwalk which nodded to Man Ray’s chessboard, outsize plastercasts of disembodied noses and eyes paid lip service to Magritte and Dali. Having used the feminist art critic Linda Nochlin’s essay title, Why Have There Been No Great Women Artists? as a T-shirt slogan last year, Grazia Chiuri has dug deeper into the question with consecutive collections inspired by female Surrealist artists – first Lucy Schwob, and now Leonor Fini, an Argentinian painter who held her first Paris exhibition in Dior’s atelier in the 1930s. This show’s looks were given names like Vertigo, Psychose, Illusion, but while Fini and the surrealists set the mood music, the silhouette was distinctively that which Grazia Chiuri has established for Dior. A slim balletic torso with the simple, functional elegance of a leotard gives way to a soft, A-line midi-length hem. The shape was consistent through daywear (long belted coats) and separates (simple, sheer blouse and skirt) and into eveningwear (a lingerie-styled gown.) Details borrowed from the Schiaparelli playbook: British milliner Stephen Jones added veils dotted with sparkling flies; miniature birdcages hung from ears; and black fishnet stockings were worn over, rather than under, strappy gold sandals.